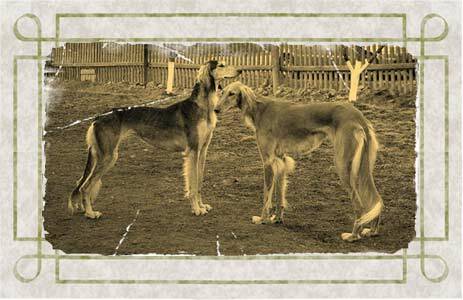 Saluki (Persian Greyhound), the history of the breed. Saluki, elegant and balanced dog, smart and independent, with dignity. It is believed that the breed got its name from the city Salyuk in the south of the Arabian Peninsula. 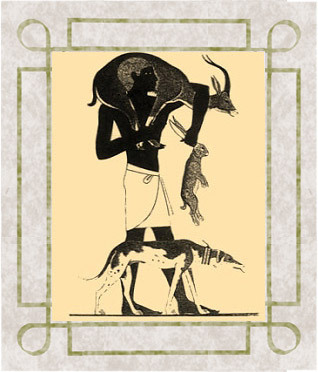 The breed originated in the ancient civilizations of the world - in Syria, Mesopotamia, Persia and Egypt up to the Caspian Sea, from Turkey to India and the Siberian steppes. At the place of the breed distinguishes five types Salyuk from a tall, bony and heavily feathered hair rock type on the gentle, shallow and low desert type. For several thousand years the breed looks almost unchanged. 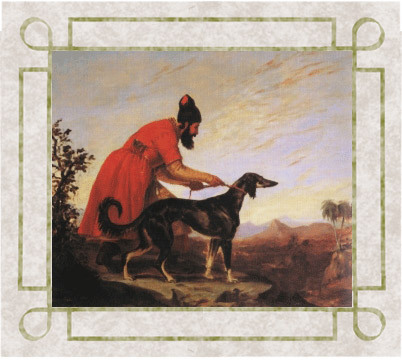 Europeans Persian greyhound became known for its crusades. Especially appreciated her in Italy and England. In ancient times Falconry with greyhounds was the prerogative of the nobility, moreover, the Ottoman rulers chose this particular dog breed. As a precious gift Saluki portrayed the governors and rulers. Because of the extraordinary agility Salukis were used primarily by Arabs in order to drive the gazelle, the fastest of the antelopes. She is able to chase prey, not stopping more than a hundred kilometers, while developing speed of 70 km / h. Such a phenomenal stamina has neither a hunting dog in the world. Saluki and - rarest of breeds, hunting "on-sighted". The first of these dogs came to Britain in 1840, they were called the Persian Greyhound. 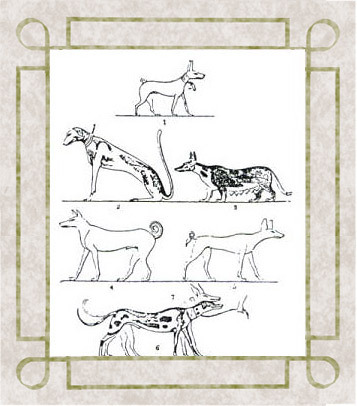 In 1863, the year Salukis were first shown at an exhibition in Germany. But officially enshrined the names have not yet had. In "Encyclopedia of the East", published in London in 1885, describing them as "Macedonian greyhounds. Factory-rock formation began in the late XIX century. In 1922, the breed was recognized by the English Kennel Club. 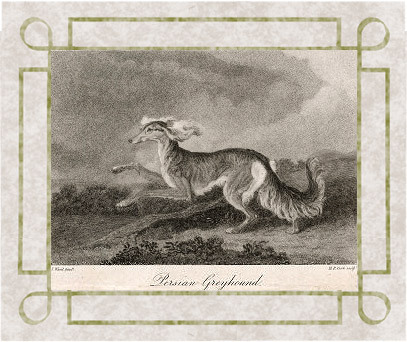 In early 1923 the British set Saluki Club, and the first exhibition Persian greyhound was adopted officially as the "Saluki" or "gazelevaya dog." From this point on "Oriental Beauty" started to conquer Europe. Saluki - the embodiment of grace and elegance. This dog agility combines high and tireless with the strength and swiftness. Posture is upright, eyes looking into the distance. Height at the withers dogs about 58-71 cm, females - 54 cm minimum. Totmesa III were made images of dogs. The breed is recognized: CKC, FCI, AKC, UKC, KCGB, CKC, ANKC, NKC, NZKC, APRI, ACR. Features and character: cleanly, betrayed his master and always tries to win his attention. Reticent towards strangers, but not nervous and not aggressive. With dignity, intelligent and independent. A worthy companion, a good keeper, gets along well with children. The head and face: the head is long and narrow, on the whole impression of vysokoporodnosti and nobility. Skull moderately wide between ears, not round. Go to the snout flattened. Nose black or dark brown. Teeth strong, white, incl. The incisors are located on the same line. Jaws strong with regular, complete scissor bite, where the upper teeth grabs the bottom without a gap, and teeth are located in the jaw at right angles. Eyes: Large, oval, not protruding. Eye color - from dark to hazel nut-brown. Look open, friendly, intelligent, full of dignity and nobility. Ears: long, hanging, mobile. Planted too deeply, close to the head, covered with long, silky hair. If the ears are moving forward, the tip of the ear skin tissue reaches corners of the mouth. Silky strands should only grow with the top half of the ear. Neck: long, flexible, very muscular. Housing: proportionate addition. Thorax elongate and lean to the buttocks, or cylindrical or flat sides, taut belly. Withers stressed, go straight topline. The back is fairly broad, muscles in the pelvic region slightly convex, not spin the wheel. Block deep, moderately narrow, long, tapering to the waist. Loin slightly arched. The croup is moderately sloped, with protruding maklokami. Makloki set wide apart. Legs: front - straight and long from the elbow to the front-carpal joint. Sloping shoulders, strong laid back with a strong muscular, though it does not create a rough impression. Forearm slightly sloped back. Scapula oblique and webs adjacent to the chest. Metatarsus strong and slightly arched. Elbows sent back, adjacent to the body and are located directly under the withers. Hindquarters - Strong and moderately angulated, long. Makloki wide apart. Hock, dry, strong, parallel to each other, low omitted, indicating that the strength of the canter and jump, with a well-decorated femur and tibia.Pazanki strong, vertical. Important sufficient length of thigh. Movement: soft and smooth, without the slightest effort at the trot. Step light, high, front legs thrown far forward a strong push back. Torso with a long, grazing step off the ground, but not thrown forward. No priplyasyvaniya or perebiraniya feet. Feet:: Of moderate length, not loose, but at the same time and not "cat." Strong and flexible. Fingers are long and arched, among them a thick coat of moderate length. Fingers are connected to a small extent of skin membrane, elongated and prominent. On all four limbs, both internal finger considerably longer than the exterior. Tail: long, smooth, set low, the charge of deep to elongate and gently sloping croup. Downcast, with a natural bend. Tail tip reaches the hock. The bottom surface is covered with thick, long, silky, but not shaggy, restroom psovinoy forming a suspension. The coat: coat tight, smooth and silky, short, with little feathering on the rear side of legs. The tail and ears covered with long silky hair. Smooth variety Saluki has no feathering. Psovina throat is permissible but not desirable. Puppies may be less sherstnost on hips and shoulders. Color:white, cream, fawn, golden-red, reddish fawn, gray and tan, black, trehsherstny (white, black, reddish-brown), black with reddish-brown, and combinations of these colors, such as reddish with black markings, red with black markings, not spotty. Brindle is not desirable. Saluki excellent cross country and hunting dog. In contrast to the beagle, has a very sharp eye, so quickly discovers the object of harassment and pursues him. To catch prey, like all eastern greyhounds, brings a host, but does not stay by her side, like the Russian Borzoi. In their homeland Salyuk and now you can find - the local aristocrats in the same way as thousands of years ago, hunted with them for foxes, hares and gazelles. Salukis can develop a speed of 70 km / h, however long that speed no living creature can not survive. Therefore, to not overwork precious dogs, hunters were placed together with them in the saddle. And then, in the form of game, Saluki literally ejected from the back of a galloping horse and put it to the prey. Could do without the hound hunting? Completely, if given her enough time and attention, at least two times per day output in the long walk and give the opportunity to participate in competitions. The main sport for the hounds: racing (pursuit of a moving target - a mechanical rabbit). In these competitions has developed special rules for conducting and certifying dogs (scores for playfulness, persistence, skill). Viewers can see the fantastic speed of the pack hounds for kinodrome imagine this old hunting dogs. In short, Saluki running quickly and willingly - and with this and is connected only one small problem with these otherwise quite perfect dogs. Their instinct is not blunted, they are reckless and curious, they all noticed and all interested - seeing a crow, they rush for black, saw a bag blown by the wind, they headlong rush for the pod ... And in those moments even the most obedient and polite Saluki simply does not hear the cries of the host, urging her to return immediately. The sad statistics: only 40% Salukis survive to complete their natural life, which would have come of age 13-15 years, and the rest 60% are killed under the wheels of cars or other accidents. Therefore, the correct host Salukis in a city with a leash not let down (and if you despise, then only in places that are securely fenced off - these great jumpers can easily jump over even for 2-foot fence - and away from the roadway). Runaway Saluki is almost impossible to catch up, so be very careful! Beginners start this breed is not recommended. These dogs need to dwell in a large space, so they can realize their great physical skills. Welcomes any active games. If the owner of a Saluki jogging or loves to ride a bike, it will be for him a tireless assistant. Paws at the Saluki solid and strong, and well-protected fur between the toes. How much would a dog or ran on a very rocky ground, she never hurt paws or fingers. Active and energetic in nature, at home Saluki quiet and peaceful. They are gentle, unobtrusive, and independent with strong nerves and great dignity. Appreciate the peace and comfort of home. This is a nice home friends are very attached to their masters Many dog experts note the similarity of character traits Salukis with a cat. The dog is not averse to lie in the warmth on the sofa with contempt will bypass the puddles on the pavement. At Saluki temperament is soft and sensitive, but not without willfulness. She is attentive, but not aggressive, very affectionate with household (including children), but some are wary of strangers. True, the increased susceptibility and fearfulness nature adjusted by selection, taking into account the fact that the desert dweller Salukis do not trust outsiders and overreact to unusual situation - a vital task. Salukis are very loyal person who will be able to win her love and trust betrayed, but without servility. As a purebred eastern greyhound, she obeys, but first think. The beauty of her character that she is much less open an outsider, rather than the owner, trusts and gives his location. There are people who believe all greyhounds stupid - say, in such a long and narrow head with little room for brains. In fact, it is absolutely not true. Smart Saluki in general often has an opinion about anything, so the dogs of this breed may seem to be difficult to train. In fact, if you want a Saluki can learn virtually anything, but to comprehend the canine wisdom, it will be for certain financial incentives such as a tasty piece, and not from a desire to please his master. Slightly arrogant and somewhat aloof, Saluki does not consider himself a servant. It does not stick to the man so that he stroked her, kissed her and threw the ball - Saluki unobtrusive and nenazoylivy and at home they are ready to sleep all day, dumping excess energy during walks, what must certainly be quite long, at least two hours a day. But if the rain on the street - what, Salukis ready to accept it once and several shorter boardwalk. However, for all its foreign reserve and aloofness Salukis not tolerate loneliness - because they actually love their owners so that if for some reason or another dog passes from hand to hand, then to such changes to get used to it very hard. Replaced the Persian greyhound owner falls into a deep and long depression often stops eating and wasting away right before our eyes - in this peaceful, independent and proud being quite difficult to assume that there would be so deep and warm feelings, and, nevertheless, they are there. Saluki - this is not a dog, you need to buy for a small child: the human small fry to this haughty beauty - not the authority, so listen to the child she probably would not. Biting a child Salukis will not - aggression towards people and especially to small, this breed is not, however, and piety in front of her toddler squeezed Salukis did not feel: boring a child she may otpihnut, and if he does not push off, then growl at it can be. However, in reality these children represent a danger for the Salukis - the child could accidentally cause the dog pain and the pain they suffer very badly. This increased sensitivity to pain was cultivated in the Saluki specifically - otherwise overly fascinated by hunting dog could never see that wounded her and continued to flee despite the injury. With other dogs living in the house, as well as with cats Saluki live peacefully and in friendship, but birds, mice, squirrels and rabbits can be treated by it as game, so it would be better not to reduce under one roof, an enthusiastic hunter and little animals that look like its prey. Saluki guard of matter - not the case. And indeed, in this dog fight, as a rule, is not torn, and why fight someone who can always run away? However, if you have nowhere to flee Saluki and circumstances compel it to fight, then it may well repel anyone. Yes, Salukis look pretty fragile, but their appearance is deceptive: in the long jaws of many excellent teeth, and if the Salukis would not be very strong, they could not run like the wind. Incidentally, the jerk Salukis, who decided to suddenly someone pursue stand far from each person. That is, someone strong and athletic, of course, endure, but a child or an elderly person behind it is not theft. (And the end it may hit your slim, dark-eyed, lop-eared beauty in those unfortunate 60% who die from accidents). But the friendly met on the street Saluki dogs loves to play, however, quickly discovered that her no one can keep up, so the game quickly loses its meaning. Therefore, breeders are advised to start immediately the two Saluki: svornye like dogs, they really appreciate the company of their kind. Young Saluki about twice as energetic and enterprising other breeds of puppies, so leave them alone in the large breeders are not advised. And they advise on the times that put a Saluki puppy in a cage - of course, most: in their words, the puppy does not feel miserable creature, the innocent jailed, the cell for it - it's his house. And left alone and free young Saluki, from childhood burdened by superfluous mind, is not limited to eating of wires and slippers - it's easy to figure out how to open the cupboard and pull out of it all pans, or doprygnet to the shelf and should be revered as standing on her laptop. However, adult Saluki, long the remaining one, too, can become frustrated and begin to destroy the house - though not Saluki pristavuchie, but the society they want. Genetically strong, the special problems they do not deliver to its owners. At the historic home that dog do not spoil. She lives in harsh conditions, where survival of the best fit, which is why she has such a strong constitution and the constitution, allowing withstand any climate. Is that in the winter, these southerners can freeze, and need warm cloths and overalls, and in the hot season - the dogs must be protected from overheating, ie, avoid heat stroke. Caring for them is minimal, it suffices to 2 times a week brushing their hair, and hair on the ears and tail comb comb. During the year, Saluki can throw a small amount of wool. In this case, their hair does not smell dog that is a feature of the breed. And in general, differ Saluki maniacal precision. They lick themselves all the time, they do not throw food, no bottled water, and generally behave in a very aristocratic way. Feeding - like other dogs, just need to take into account the load on the motor apparatus: Greyhounds love to vilify on level ground at breakneck speed, just for my own pleasure. Health problems: mainly (but rarely!) Marked disturbances of the musculoskeletal system. As a rule, suffered elbow and hip joints. Do not purchase a Saluki without medical cards parents. 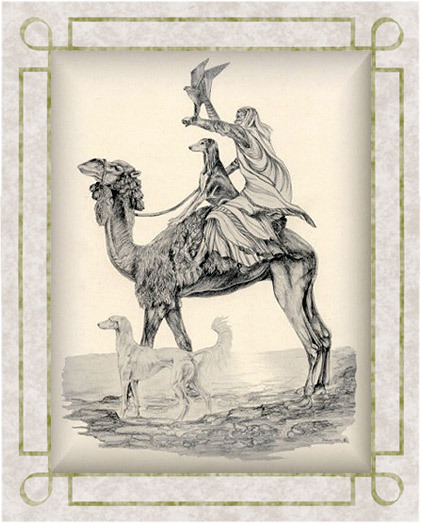 They say that some Arab nations believed Saluki being so fantastic, that make her the object of sale was absolutely impermissible: Salukis could only give, and even then only a very respected person. Now everything, of course, somewhat easier, although that is suitable whether the dog is right for you, we must think carefully.